The brain requires a large amount of oxygen and glucose to meet its high metabolic demand. Therefore, its circulation has structural and functional adaptations to ensure a consistently high blood flow is maintained. Any interruptions to this supply will lead to a loss of consciousness in a few seconds and irreversible damage to neurones after 4 minutes. The brain is just one of many organs to have a specialised circulation. This article will explore the structural and functional adaptations of the brain’s circulation. 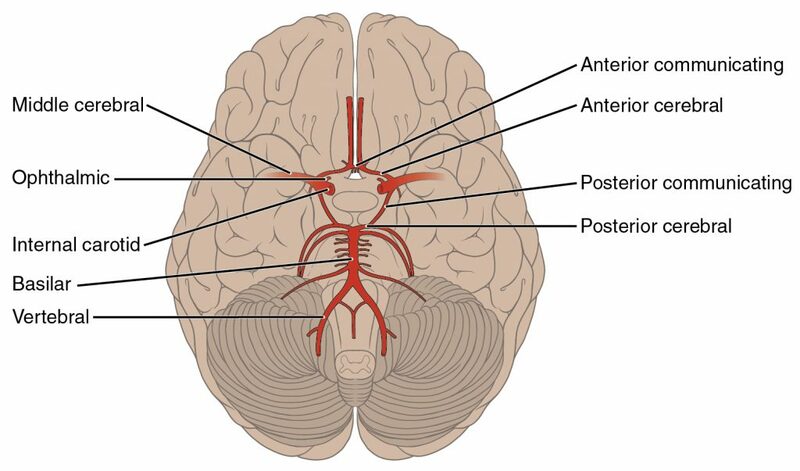 Circle of Willis – anastamoses between the basilar and internal carotid arteries. This means that even if one artery is damaged, blood flow is not compromised. Blood-brain barrier – a highly selective barrier between the systemic circulation and the brain’s extracellular fluid formed by endothelial cells. Permeable to lipophilic molecules such as O2 and CO2. Impermeable to lipid insoluble molecules like K+ and catecholamines. Protects the brain from potentially harmful neurotoxins and helps prevent infection from spreading to the brain (causing encephalitis). This allows blood vessel diameter to change in response to changes in partial pressure of arterial CO2. Metabolically active tissues may produce a local hypercapnia (raised CO2) when their activity exceeds their blood supply. They continue adding CO2 to the blood but cannot get rid of it at the same rate. Therefore hypercapnia is a sign that blood and oxygen supply is inadequate and causes vasodilation to increase blood flow. Conversely in hypocapnia, vasoconstriction occurs. Raised intracranial pressure, such as in the case of a cerebral tumour or haemorrhage, can impair cerebral blood flow as it pushes against blood vessels. When this occurs, it is detected by vasomotor control regions in the brainstem which then increase sympathetic vasomotor activity in a reflex. The resulting peripheral vasoconstriction and increase in heart rate and force of contraction raises arterial blood pressure to force the blood vessels open and maintain adequate cerebral blood flow. This high blood pressure is detected by baroreceptors in the aortic arch and carotid sinus which causes an increase in vagal tone to the sino-atrial node. This produces bradycardia (slow heart rate). Therefore, clinically, hypertension combined with bradycardia indicates a high intracranial pressure. Panic attacks can cause a person to hyperventilate. This produces hypocapnia as CO2 is breathed out faster than the body is making it. The resulting hypocapnia causes cerebral vasoconstriction via metabolic autoregulation. This constriction reduces the flow of blood (and therefore oxygen and glucose) so that the brain isn’t getting enough oxygen to maintain consciousness. This causes syncope. Which of these arteries is not found in the Circle of Willis? Which is not a purpose of the blood-brain barrier (BBB)? Which of these is not true of myogenic autoregulation in the brain?